While The Pet Sounds by The Beach Boys is playing through the speakers we are tasting a new release by Glengyle Distillery. This is the first release to be (specifically) matured in sherry wood, at the same time a bourbon matured version was released. Glengyle is a distillery in Campeltown, originally built in 1872. Already in 1925 Glengyle was closed for a period of 75 years. After being acquired by the owner of Springbank in 2000, the distillery restarted production in 2004. In 2007 a first limited 3 year old was released, subtitled "Work In Progress". Meanwhile, apart from the Sherry and Bourbon Woods, four Works In Progress have been released so far. Another noticeable thing to mention is that Glengyle uses the stills, spirit safe and spirit receivers of the now closed Ben Wyvis distillery (ever tasted Ben Wyvis? We salute you!). 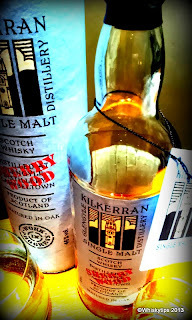 This alone is a good reason to buy a bottle of Kilkerran..
By the way, the whisky is not named after the distillery because Glengyle was already in use for a blended malt by Loch Lomond. Of course this whisky is non chill filtered and has natural colour. Add a drop of water, swirl gently and enhance your nosing and tasting experience. The water is from Crosshill Loch. They also try to use as much local barley as possible. The malting is done at the neighbouring distillery of Springbank. Finish: Tannines again, taste still develops, medium dry and now some (charred) wood appears. 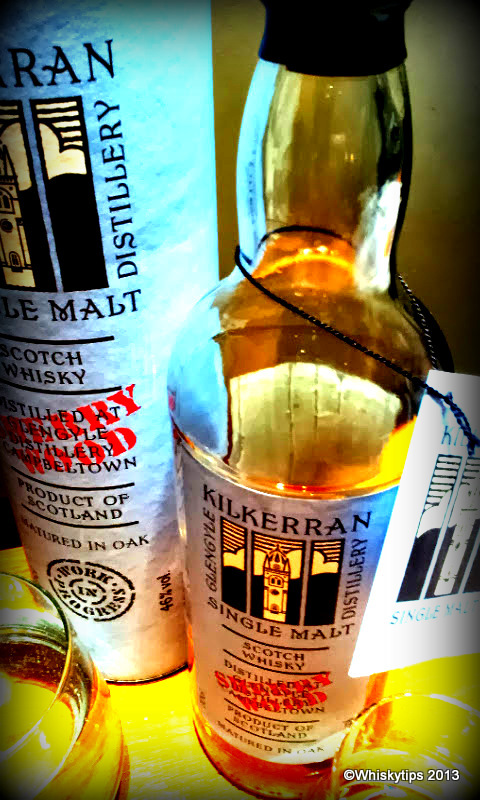 Allthough this Kilkerran release is also called Work In Progress and the whisky has the young, quite fierce character, at the same time there's already a wonderful nose and oily feeling to this malt. This makes it an very interesting experience, to see how Kilkerran will develop over the years into the optimal flavoursetting, while keeping in mind the very capable people of Springbank are involved.